Since Jeb Bush announced he was pulling out of 2016 Presidential Race it seems establishment GOP has placed their money on Marco Rubio. In 2010 Rubio nabbed George P. Bush Jeb’s son by hispanic migrant workers daughter. Bush family have deep ties in Texas and Texas A&M. Interesting is new Texas A&M campus in Israel. Those who truly understand biblical prophecy and true symbolism of “Beast Trade System”, Great Harlot would understand. With Mitt Romney coming on the presidential political scene and Rubio’s rejection of Cruz as VP to take on Trump will Rubio choose Romney and give Poppy Bush his preferred choice from 2012 election? The first question is who is Marco Rubio? Marco Rubio like Raphael “Ted” Cruz has connections with Cuba. Marco is the son of Cuban immigrants Marlo and Oriales Garcia. Rubio was born 28 May 1971. Huffington Post reported. Mario and Oriales, did adopt the anti-Castro position of many exiles who are opposed to the communist course taken by the Cuban revolution, the date of their emigration was not 1959 and the cause of their departure was not the current Cuban government. They left Cuba in 1956 as exiles from a tyrannical regime; that of Fulgencio Batista Zaldivar, the right-wing dictatorship that Fidel Castro overthrew. The tributes paid by Rubio to the thugs who toppled the second Cuban republic on March 10, 1952 are totally undeserved, and he knows it. Rubio knows, due to the experience of his own parents, that when he supported dedicating the new FIU law school building to Rafael Diaz-Balart he was paying homage to one of the politicians who brought an end to representative democracy in Cuba, one of those truly responsible for the flight of his parents. So it seems Ted Cruz and Marco Rubio’s parents supported opposing dictators during Cuba’s conflicts. Although some reports say Rubio’s parents returned to Cuba several times after Castro gained power. Marco Rubio also lived period of childhood in Las Vegas, Nevada. 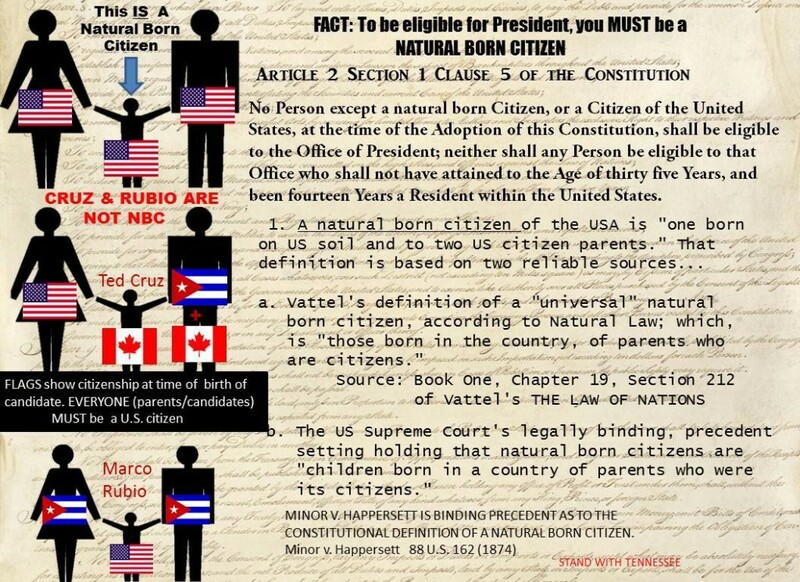 Marco Rubio like Ted Cruz does not meet constitutional requirements for president as stated in Article 2 of U.S. Constitution and defined by Vittel’s Laws of Nation. THE TRUE FOUNDATION OF AMERICAN LAW. America is being reshaped and destroyed by silent encroachments of overturning our foundational laws and foundations as prophesied in Daniel 7:25. We have not only lost our true north we have lost our identity as a nation allowing consistent changes from our foundational laws. Joseph Story (1779-1845) was an Associate Justice of the United States Supreme Court and a founder of Harvard Law School. 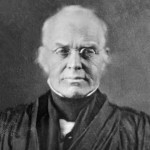 He was appointed to the Supreme Court in 1811 by the so-called “Father of our Constitution,” President James Madison. “It is indispensable, too, that the president should be a natural born citizen of the United States; or a citizen at the adoption of the constitution, and for fourteen years before his election. This permission of a naturalized citizen to become president is an exception from the great fundamental policy of all governments, to exclude foreign influence from their executive councils and duties. It was doubtless introduced (for it has now become by lapse of time merely nominal, and will soon become wholly extinct) out of respect to those distinguished revolutionary patriots, who were born in a foreign land, and yet had entitled themselves to high honours in their adopted country. A positive exclusion of them from the office would have been unjust to their merits, and painful to their sensibilities. ~Supreme Court Associate Justice Joseph Story in his Commentaries on the Constitution of the United States (3 vols., 1833), on why the Framers included the grandfather clause. RUBIO FLIP-FLOPS ON RELIGION AND FAITH. Rubio has changed his religious beliefs several times and went from Catholic, to Mormon to undenominational. Will Rubio revert back to Mormonism since Mitt Romney announcement to enter 2016 GOP presidential race to save GOP establishment party? MARCO RUBIO FLIP-FLOP ON IMMIGRATION. 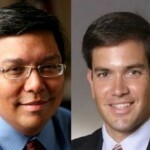 ICE President Chris Crane called Marco Rubio betrayed ICE. Chris Crane who is 13 year ICE agent and military veteran. Marco Rubios consistent flip-flop on immigration and amnesty is consistent throughout his short poltiical career. GOP’s “religious” roundtable political candidates have not lived up to their promises as the left wing of this two-party system John Adams warned would destroy the republic. It has now been revealed Sen. As stated in video below under constitutional law had H.W. Bush and Congress not voted their powers of naturalization away in 1991 hiring illegal immigrants when Americans are out of work is unconstitutional. Federal Immigration and Nationality Act Section 8 USC 1324(a)(1)(A)(iv)(b)(iii) prohibits transfer or hiring illegals. Rubio’s hand in massive replacement of American workers in Florida even with Disney executive workers in his continued support for H1B Visas. Rubio’s backers and his support in advancing massive H1B visa have led to massive construction and agricultural jobs for Americans in Florida and throughout U.S. while he’s served as Florida Senator. Marco money backers range from mysterious “hush money” funding of ad campaigns to frontmen with ties to George Soros and even Rothschild’s. In 2012 Rubio was fined $8K for campaign violations. 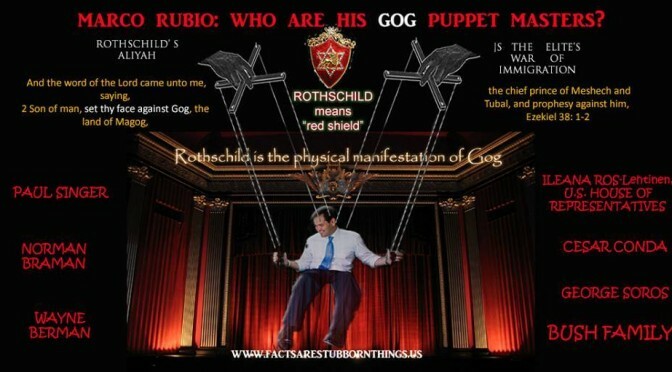 In fact the massive corrputions of Marco Rubio’s political career exposed in 2012. Hedge-fund billionaire Paul Singer’s decision to throw his financial weight behind the donor-class 2016 favorite, Sen. Marco Rubio (R-FL) has sparked fresh questions about Rubio’s coziness with the financial interests funding his career. Singer was a major financial force behind the Rubio-Obama amnesty and immigration expansion push in 2013. 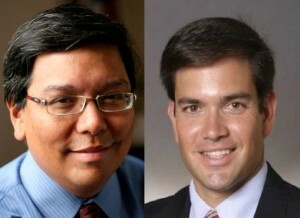 Cesar Conda is Marco Rubio’s Chief of Staff. He recently made his Tweets private (protected) so the general public can’t ready them. Cesar Conda has been pushing amnesty for illegals on Twitter and elsewhere as Marco Rubio’s PR agent. Conda, who is an immigration lawyer, went to work for George Soros before becoming Rubio’s Chief of Staf. Cesar Conda worked on the editorial advisory board of George Soros magazine, The International Economy Magazine. Cesar Conda had been spinning lies about the amnesty bill about how illegal wouldn’t get welfare, wait more than 10 years for citizenship, etc. Those lies have been completely debunked. Miami’s Norman Braman is the biggest bucks behind Marco Rubio. The Forward looked at the top political donors from the 2014 elections and found at least “a third of the most generous 50 mega-givers were Jewish. In fact, contributions from Jewish billionaires and multi-millionaires dominated the top 10 spots on the list.” Norman Braman is Rubio’s ties with Rothschilds. It seems all candidates must sell themselves to Council on Foreign Relations (CFR) which Hillary Clinton stated ran the nation. Senator Marco Rubio (R-FL), candidate for the 2016 Republican presidential nomination, joins CBS News’ Charlie Rose to outline his foreign policy views. Rubio offers a vision of U.S. foreign policy resting on “three pillars”: preserving U.S. strength, protecting the U.S. economy, and maintaining clarity on U.S. values. Over the course of the conversation, Rubio discusses ongoing areas of interest for U.S. foreign policy, including the Islamic State group’s rise in the Middle East, the crisis in Ukraine, the Syrian Civil War, the ongoing nuclear negotiations with Iran, China’s assertiveness in the South China Sea, and the threat of global terrorism. Rubio additionally offers an assessment of U.S.-Cuba relations, criticizing the Obama administration’s initiative to normalize relations with the Castro government. In link below is Rubio’s speech to CFR with both audio and text.